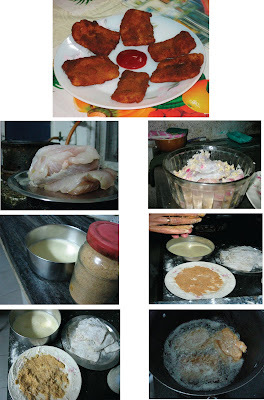 Fried fish in any guise appeals to Bengalees. Indeed without the Maach bhaja, the maacher jhol cannot be attempted and there would be glaring gaps in the PaNch bhaja that precedes any seriously formal meal. This time I will be documenting the non-traditional, but beloved Fish Fry. Breaded fried fish fillet was an addition that came with the Raj but it has stayed firmly in the Bengalee culinary repertoire as aparticular favourite at wedding banquets. One reason is that it does take longer to prepare than the generally marinated fish steaks that are made into fried fish. There's also the fact that Bhetki which is generally used as the base for preparing the boneless, thin fish filet is an expensive fish. It remains therefore a treat. These were prepared by my mother-in-law who is a dab hand at all Bengalee dishes. Quite a few steps can be prepared ahead, so the final frying can be done in a flourish allowing for serving it hot. I find it best to ask the fishmonger to fillet my fish. They must not be thicker than half centimtre. A good sushi knife ought to help in doing it at home. Mine are generally thicker than the requisite half centrimtre though :(. The fish was procured and thoroughly rubbed with salt and lemon juice before freezing and later thawing before use. If using freshly bought fish, proceed immediately with marinating in the ginger-onion-garlic-chilli which is made into a paste. Half an hour at room temperature is sufficient for the marination. In the meantime tip on a flat plate 1 cup, some salt and pepper and mix up thoroughly. Make the batter in a blender (or whisk) with the eggs, salt, baking powder and white flour. Drain the filets from the marinade and coat them thoroughly with the flour. Set all the filets aside one by one andd start heating up the oil in a kadai. Spread the bread crumbs or ground lede biscuit onto another plate. Lede biscuit is the preferred crumb of the old fashioned. I myself use stale bread crumbs accumulated over a period. Dip the coated filet in the egg batter, coat it immediately with the crumbs and gently put into the oil which should be very hot by now. The flame is lowered and each side is cooked to brown perfection for about 3 minutes. The thickness of the filet is thus rather important. Avoid browning too much. The crispiness and softness has an optimum value.Drain and keep hot. Though ketchup goes well, I think the quintessential Bengalee way is to have it with kasundi.